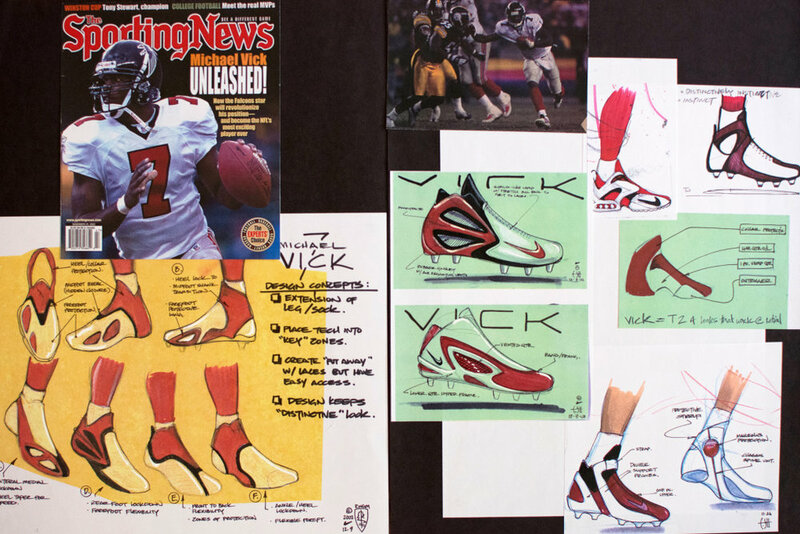 At Nike’s headquarters in Beaverton, Oregon, Michael Vick opened E. Morris’ portfolio. It was his first time seeing the designer since the restaurant in Buckhead, and he had no clue why these individuals were on the page. All of the figures had changed the definition of what they’d set out to do — they shook up the world. “What do you think you will contribute as a player in the league compared to what they did?” Morris asked. To this day, Vick’s response to the question has stuck with the designer. “I want to be unexpected,” Vick said. In our latest episode of Open the Box, we kick it at former QB Mike Vick's crib while discussing his beloved Nike Zoom Vick signature shoe line. Check out the video above, as he talks his favorites in the line, working closely with Nike over the years and what each signature personally means to him. Nike shoe designers gave Couch a white prototype shoe and told him scribble on it or draw whatever he wanted. 'So I sat down and my mom started reading a story and I started doodling on it. I liked the design - it was stream of consciousness,' he said. Shoe designer E. Scott Morris gave him some ideas and some feedback, but the final design was all his own, Couch said.